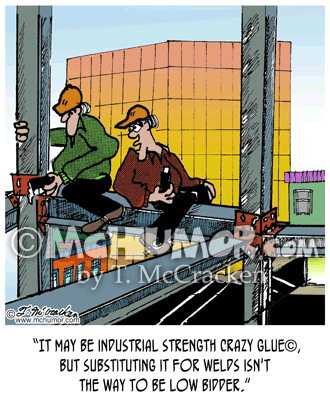 Welding Cartoon 1940: A construction worker saying to another, "It may be industrial strength Crazy Glue©, but substituting it for welds isn't the way to be low bidder." 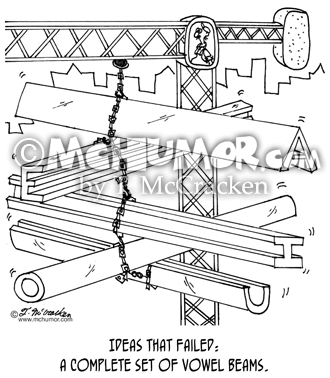 Construction Cartoon 6415: "Ideas that failed: A Complete Set of Vowel Beams." 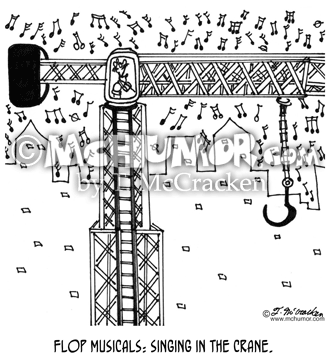 A crane hoists A, E, I, O and U beams. 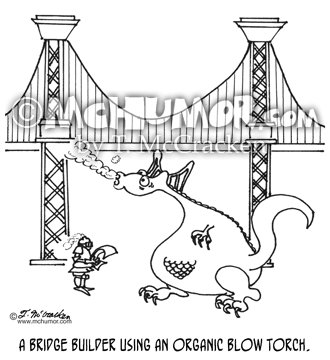 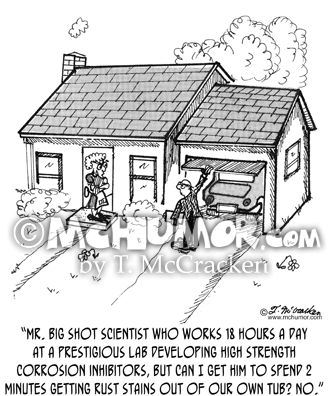 Welding Cartoon 3697: "A bridge builder using an organic blow torch." A knight uses a dragon. 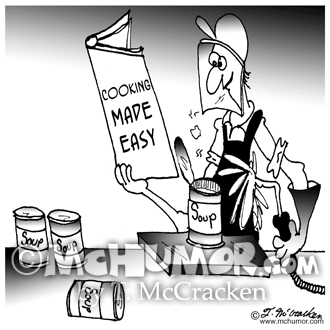 Welding Cartoon 6545: A welder reading "The Joy of Cooking" while using his blowtorch to heat up a can of beans. 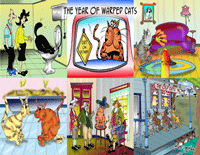 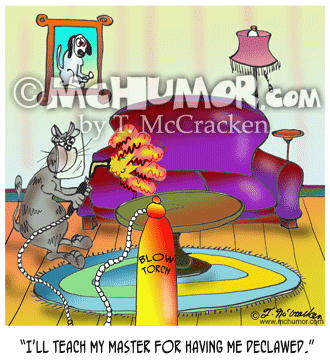 Welding Cartoon 6567: A cat with a welding torch aimed at furniture saying, "I'll teach my master for having me declawed." 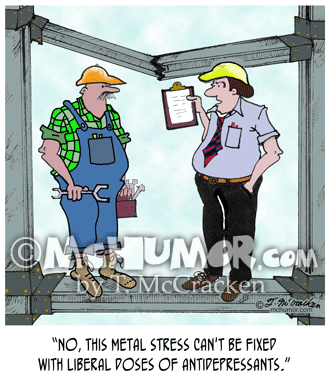 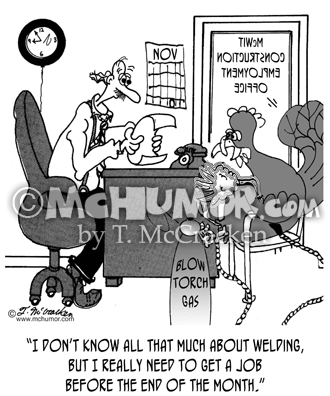 Welding Cartoon 9082: A turkey in November in a Welding Employment office saying, "I don't know all that much about welding, but I really need to get a job before the end of the month." 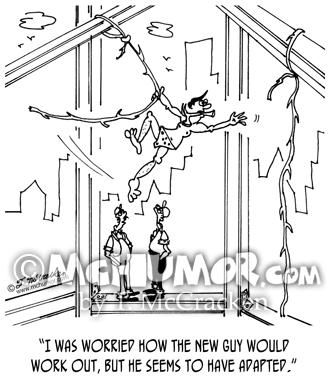 Tarzan Cartoon 6380: As Tarzan swings from one girder to the next a construction worker says to another, "I was worried how the new guy would work out, but he seems to have adapted."